» It’s back! Postal convenience! This is not the kind of breaking news that in the old days might have stopped the press, but from the standpoint of convenience it’s a big deal: The drive-up drop box outside the Albany Post Office on First Avenue has been restored. 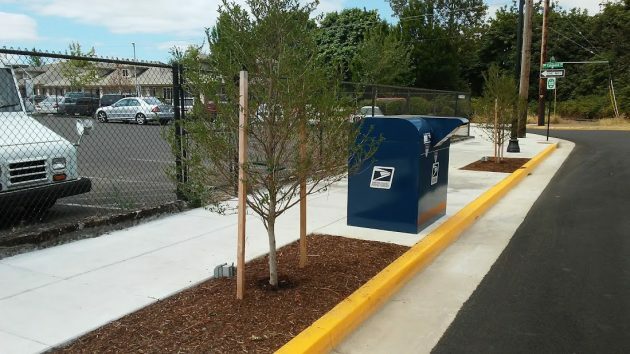 Not only that, but the Postal Service came up with a brand-new box to replace the one that was there until it was taken out last winter because the sidewalk was being rebuilt as part of the downtown streetscape project. The old one had been in place for many years and showed it. 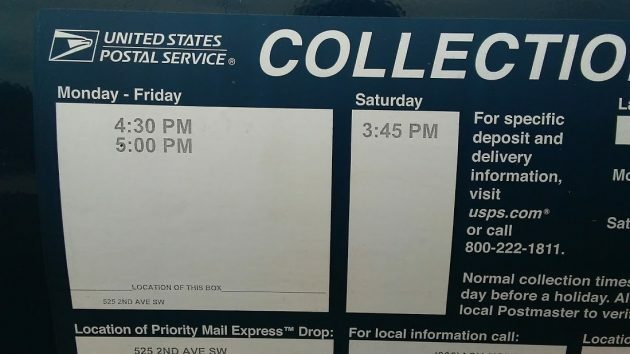 A few weeks ago, in May, when I asked her about it, newly installed Postmaster Pamela Moody told me she would have to review the situation before deciding whether to replace the box. Evidently the review took place and concluded there would be no problem with putting a new box in the same spot as before. A dash of excellent news on this dark Russian/Republican day. Talk about foreshadowing. Hering’s simple sentence points to what is certain to be the next controversy that will threaten to shatter the uneasy peace on Albany City Council – namely the inevitable conflict certain to rear its ugly head once the CARA-SELL opens. The USPS is secretly considering reinforcing the wall nearest the newly re-installed mail box to protect against future road rage incidents they feel are inevitable once the CARA-Sell opens for business and conflicts between Postal Patrons and carousel aficionados begin to multiply, perhaps exponentially. One hopes Hering’s comments are wrong. More likely, his analysis is close to correct. The future of downtown Albany is rife with potential danger. We should thank Mr. Hering for his heads-up.